WASHINGTON (CNS) — A decade after the bishops of Mexico and the United States issued their first joint pastoral letter on the immigration-related challenges facing their countries, a panel of commentators observed that the situation remains much the same. However, as described by the authors of several essays in a new book intended to give current context to the 2003 letter “Strangers No Longer: Together on the Journey of Hope,” there are signs of progress — as well as some backsliding — in addressing some of the issues it raised. The letter touched on shared problems of the two countries, such as how to live out the teachings of faith in responding to migrants, how to address legal complexities, how to help people find the economic stability to allow them to remain in their own countries and how to address other root causes of migration. The new book, “On ‘Strangers No Longer’: Perspectives on the Historic U.S.-Mexican Catholic Bishops’ Pastoral Letter on Migration,” includes a dozen essays, by scholars and activists from both countries about the historic and contemporary issues raised by the pastoral letter. At a panel discussion in Washington Sept. 9 at The Catholic University of America, several of the authors described their articles and how they see the current situation. For example, Don Kerwin, director of the Center for Migration Studies and the former director of the Catholic Legal Immigration Network Inc., said that through U.S. history, anti-immigrant attitudes have almost always come from outside the Catholic Church, often directed at Catholic immigrants. Catholics — both institutionally and individually — have long been at the forefront in providing aid to immigrants and in leading campaigns for better conditions for immigrants of all sorts. “But today, Catholic politicians are among the most strident foes of immigration reform,” he said. “The anti-immigrant politicians are Catholics and the people they’re talking about making life difficult for are their fellow Catholics,” Kerwin said. He added that laws to subject immigrants to harsh scrutiny and tough penalties “are motivated by everything except faith” and show little regard for the principles of Catholic social teaching. Todd Scribner, education outreach coordinator for Migration and Refugee Services of the U.S. Conference of Catholic Bishops, wrote on the history of the church’s public policy activities on immigration. He noted at the event that decades before the U.S. bishops had formally constituted themselves as a conference, they were active in fighting laws and policies that gave immigrants less than full citizenship rights and benefits and in trying to welcome immigrants into the church in the United States. Patricia Zamudia, a professor of sociology at the Center for Research and Graduate Studies in Social Anthropology in Xalapa, in the Mexican state of Veracruz, said at the Catholic University program that Mexico has had to adjust to the realities of sending migrants across its northern border, receiving them across its southern border and, recently, having many people come back from the United States. 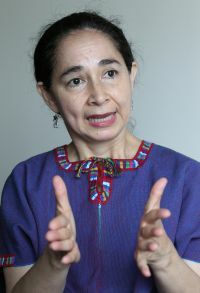 In a follow-up interview with Catholic News Service, Zamudia said that in the last few years as more and more Mexicans have been deported, or chosen to go home because of the weak U.S. economy of the last decade, her country has had to cope with the complexities of folding that population back into the community. She described the phenomena of people who are “stuck” between their homes in the U.S. — sometime of decades’ duration — and their native towns, where they no longer fit in and where there may be no jobs or other means of support. Often the hometowns “don’t have the capacity to receive them,” beyond offering shelter for a short stay, she said. And there are complications caused by long stays in the United States, even when someone is going back to their hometown. Children raised in the U.S. who move to Mexico with deported parents are accustomed to entirely different ways of behaving in school, for example, leading to extra difficulty in adjusting to a new home. Zamudia also elaborated on her earlier comments about the role of the church in bringing changes to Mexican laws. She said although some of Mexico’s bishops have been strong supporters and vocal advocates for assistance to migrants and better immigration laws, the real push has come from the grass roots. The church’s influence on migration matters is generally well accepted by politicians, in part because it’s not seen as having a political or financial interest in treating immigrants better, she said. Shelters, dining rooms and other aid to people on the move is quite common now on both borders, often run by Catholics, whether through parishes or unaffiliated groups, according to Zamudia.